The latest iteration of the championship-winning Suzuki RM-Z450 has landed in Australian dealerships. The highly anticipated 2015 RM-Z450 will break cover on Saturday, May 17. The RM-Z450 dominated the Australian racing scene in 2013 winning both the premier class MX Nationals MX1 and Supercross Pro-Open Championships. Suzuki Australia has released a limited edition race replica version of the RM-Z450 race bike to commemorate Matt Moss's 2013 racing success in winning both the Australian Motocross and Supercross Championships. Suzuki is kick-starting the new year offering championship-winning pricing on its top-selling, fuel-injected motocross models, the Suzuki RM-Z250 and the RM-Z450. The latest version of Suzuki's Australian Championship-winning motocrosser, the 2014 RM-Z450, is now available. 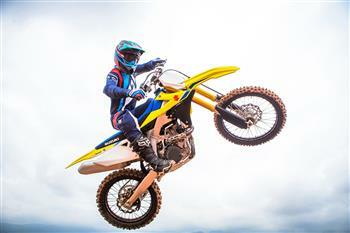 The latest version of Suzuki's cutting edge four-stroke motocrosser, the 2014 RM-Z450, has been unveiled. Suzuki is offering a generous $750\* factory bonus on its top-selling, fuel-injected motocross models, the Suzuki RM-Z250 and the RM-Z450. The all-new 2013 Suzuki RM-Z450 has just arrived on Australian shores and has already impressed Team Motul Pirelli Suzuki MX1 Rider Cody Cooper. The fifth generation of Suzuki's cutting edge open class, championship-winning, 4-stroke motocrosser, the all-new 2013 RM-Z450, has arrived in Australia, packed with substantial upgrades to win bar-to-bar battles. The fifth generation of Suzuki's cutting edge open class, championship-winning, 4-stroke motocrosser, the 2013 RM-Z450, has just been announced, packed with substantial upgrades to win bar-to-bar battles. The 2012 model of the championship-winning Suzuki RM-Z450 is now available in Australia, race ready out of its crate and set to deliver results. 2011 Suzuki RM-Z450 Is Here! In exciting news for budding motocross and supercross riders, the 2011 model of the championship-winning Suzuki RM-Z450 is now available in Australia, ready to race right out of the crate. Two years after revolutionising the motocross world with its fuel-injected engine, Suzuki's championship-winning RM-Z450 motocrosser has raised the bar again, with the new 2010 model boasting a host of upgrades. The 2009 model of new Australasian Supercross Champion Chad Reed's weapon of choice, the Suzuki RM-Z450, is now available in Australia.